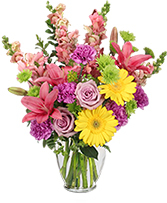 The Touch of Spring® Bouquet brings fresh beauty and color to your special recipient's door in honor of spring's long awaited arrival! 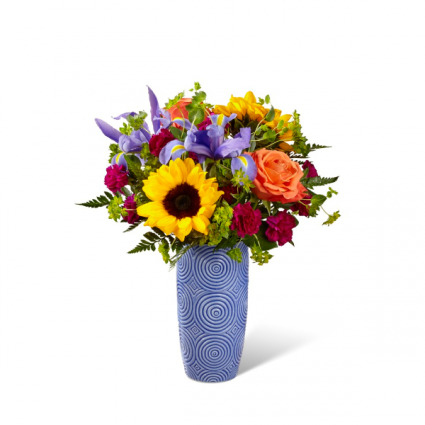 Bold sunflowers and orange roses take center stage of this fresh flower arrangement surrounded by the complementary colors of blue iris, violet mini carnations, and lush greens. 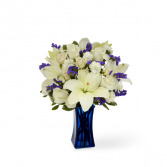 Presented in a stylish ceramic blue vase embossed with a modern circular patter throughout, this gorgeous spring bouquet is ready to celebrate a birthday, graduation, or send your warmest thank wishes to you special recipient. GOOD bouquet is approx. 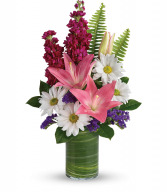 16"H x 12"W. BETTER bouquet is approx. 16"H x 13"W. BEST bouquet is approx. 17"H x 15"W.